The Virtual I/O Server (VIOS) is part of the IBM PowerVM® feature on IBM® Power Systems™ and part of the IBM POWER® Hypervisor™. The VIOS is also supported on IBM BladeCenter®. The server is a single-function appliance that is in the logical partition (LPAR) of the Power Systems server. The VIOS facilitates the sharing of physical I/O resources between client partitions (IBM AIX®, IBM i, and Linux) within the server. The Virtual I/O Server provides a virtual SCSI target, N_Port ID Virtualization (NPIV) target, and Shared Ethernet Adapter (SEA) virtual I/O function to client LPARs. The Virtual I/O Server has the capability of a hardware management function, the Integrated Virtualization Manager (IVM). IVM is a simplified hardware management solution that inherits most of the Hardware Management Console (HMC) features. The console manages a single server, avoiding the need of a dedicated personal computer. This device is designed to provide a solution that enables the administrator to reduce system setup time and to make hardware management easier, at a lower cost. IVM provides a management model for a single system. Although it does not offer all of the HMC capabilities, it enables the exploitation of PowerVM technology. IVM targets the small and medium systems that are best suited for this product. There are many environments where there is the need for small partitioned systems, either for test reasons or for specific requirements, for which the HMC solution is not ideal. A sample situation is where there are small partitioned systems that cannot share a common HMC because they are in multiple locations. In these cases, IVM works. Using IVM, companies can more cost-effectively consolidate multiple partitions onto a single server. With its intuitive, browser-based interface, the IVM is easy to use and significantly reduces the time and effort that is required to manage virtual devices and partitions. 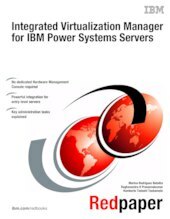 This IBM Redpaper™ publication provides an introduction to IVM by describing its architecture and showing how to install and configure a partitioned server by using its capabilities. This document is intended for IT personnel who have a complete understanding of partitioning before reading this document.